Every class change, every trip to the bathroom or the lunch room or the bus is an opportunity for a bully to strike. Girls are much more devious and viscous in their bullying - boys much more straight forward. By and large boy's bullying is physical, girl's bullying emotional - not to say that both types don't have shade of the other but there primary components are clear. 2. The bully who knows he's tougher than the other kid and proceeds to make the weaker kid suffer (like Biff from Back to the Future). Being keenly aware of what it felt like to be bullied, we determined from Kindergarten our son would be equipped to deal with it physically and psychologically. Enter Martial Arts - from 5 years old forward, he trained in the art, discipline, and techniques of a martial artist. As a tiny guy with glasses, I feared the worst for him in Kindergarten but through an effervescent personality, watchful teachers and the training he was receiving he avoided it. Moving forward, he began to recognize bully in others and started stepping in to defend the under dog. Martial arts gave him the confidence he needed. The first instance took place on the 2nd grade play ground, between a bully and an autistic kid. My son (who I will call Caleb), told the bully to stop. 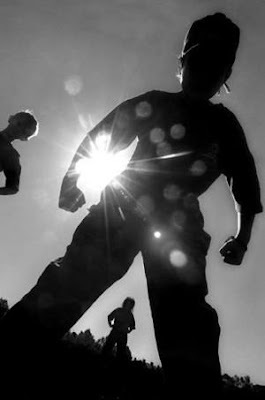 The bully did not, Caleb ushered him under a sliding board (outside of the watchful eyes of the teachers) and delivered a big punch to the stomach. Doubled over in pain, the bully was informed that he'd gotten off lightly, this time... I gushed with Motherly joy and pride at the story to which my 2nd Grader said, "Yeah, but now the Autistic kid hugs me every time he sees me." Thus, began the dynamic of Caleb the bully destroyer. This pattern and behavior continued through Elementary School but due to strict supervision the instances where Caleb was called to step in were limited to 3-4 times a year. Middle School, from a bullying perspective is a remake of "The Lord of the Flies". When asked this week why he was coming home with so many stories of fights, he exclaimed, "Mom, they are like zombies! They just keep coming! I deal with one and next week there is another to take his place." He was talking about The Challenger type. Digging further, he revealed that he regularly steps in against Biff the Bully. So he deals with both kinds on a daily basis. I said, "So describe the Challenger, what is this kid like?" Without missing a beat he said, "Oh, those are the Black kids from the Hood." I scoffed, "Caleb, you are in one of the nicest public schools in the city, there are no kids from the hood that go to your school! When I went to school, there WERE kids from the Hood but you? No way." He shrugged, eleven year old's are not into nuance. "Well, they walk down the hall and act like they are from the hood, so it's most of these guys that are try to fight me." I shake my head in bewilderment, "So what about the other type?" I ask. "Oh, those are the big white guys, lots of times football players." So why to the black kids from Upper Middle Class Suburbia act like they are from the Hood? 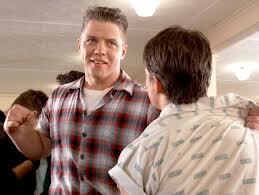 Why do large white kids from the same demographic act like Biff the Bully? Vast tomes of psychological research delve into the under lying reasons for both types of behavior. The gist of the matter, for both, are feelings of inferiority and uncertainty. Honestly, I believe we spend so much time trying to figure out what makes people do bad things that we loose sight of the fact that they are DOING bad things. Eleven year old boys don't really care why people are doing something, they are much more pragmatic in how they deal with it and deal with it, they must. Faithful readers, this subject can be explored for weeks to come! Until next time, Dolley.